The One and Only Ivan.. 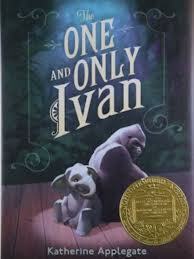 I downloaded the audio of The One and Only Ivan after reading about it in my Chinaberry Books catalog. It looked like a cute story and the right length for a three hour drive alone. Perfect. I plugged in my iPhone and took off. It was a lovely, heart-warming way to spend my time in the car. The One and Only Ivan is the story of as silverback gorilla who spends most of his life alone in a cage as a shopping mall attraction. His only companions are an elephant, a stray dog, and the daughter of the mall janitor. His only entertainment is a television (when his owner remembers to turn it on), and his art supplies (crayons and paper). Ivan is an artist. His owner provides Ivan with crayons and paper, not because he recognizes Ivan’s gift, but because he can sell Ivan’s drawings for twenty a bucks a piece in the mall gift shop. Fortunately for Ivan, Julia, the janitor’s daughter, does recognize his gift, and she sneaks him paints. Little does Julia know, however, that Ivan will use the paints to help help Ruby, a baby elephant and the mall’s newest attraction. Ivan has become used to life in his lonely “habitat.” It’s not in his nature, nor in the nature of gorillas in general, to complain. But he does know that Ruby deserves better – the chance at a life with other elephants. He also made a promise to a special friend that he would save Ruby. I tend to be skeptical of animal stories that garner sympathy for the animals by making all the humans look cruel and greedy or stupid and insensitive. This novel doesn’t fall into that trap. Even Ivan’s owner is more pathetic than cruel, and most of the humans he encounters are kind. The One and Only Ivan is a beautiful, touching story, about friendship, determination, and kindness. And that alone would make it a wonderful book, but it is actually based (although loosely) on the story of the real Ivan – a gorilla who really did live most of his life alone in a mall cage. The real Ivan’s story did have a happy ending. You can read about his life on the Atlanta Zoo page. The story of Ivan’s capture and the deaths of his parents and sister might be upsetting for some younger readers. – Do animal have feelings? -As humans what is our responsibility to animals? -Are zoos a good thing or are they cruel? How about circuses?